Kale has become a very popular leafy green, but how does it stack up when compared to spinach? After trying some of my kale and mango salad (see recipe below), my mother-in-law asked me if kale was really better than spinach. With the increased popularity of kale over the past several years, you may be wondering the same thing. 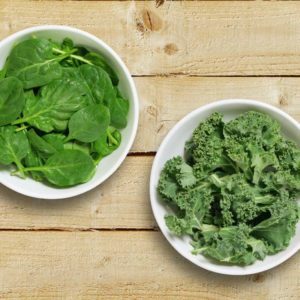 Is kale really more nutritional than other leafy greens, or is good old-fashioned spinach just as good as kale? Like kale, spinach is also a good source of calcium, potassium, fiber, folate, and vitamins A, C, and K. Spinach also contains a number of antioxidants, such as flavonoids, that may reduce the risk of diseases like cancer and heart disease. 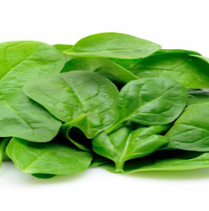 Spinach is also a rich source of iron and vitamin E (an antioxidant). Kale is higher in vitamin C while spinach contains more iron and vitamin E, but even though there are slight variations in the amount of nutrients each vegetable provides, the overall nutritional profile is similar for both. Since spinach and kale both provide a number of the same vitamins and minerals that are important for your health, you can really choose whichever one you prefer. Remember that it is always important to eat a variety of different color vegetables, to make sure you are obtaining each one’s distinct benefits. Kale and spinach can be sautéed, steamed, added into soups or salads, or mixed into foods such as omelets, lasagnas, or in refreshing green smoothies. Here is one of my favorite ways to eat kale. If you’ve never tried raw kale, give it a go! This recipe is a hit even with non-kale lovers. In a large bowl, mix kale with half the lemon juice, and a drizzle of olive oil. Gently massage with your hands to soften the kale. (Don’t skip this step! Kale can be quite tough and this really helps moisten it). Set aside, while you prepare the rest. 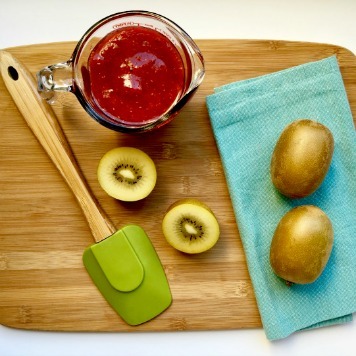 Make the dressing by mixing the rest of the lemon with the honey. Slowly stream in the olive oil. Pour dressing over kale, top with mango and slivered almonds, toss and serve. 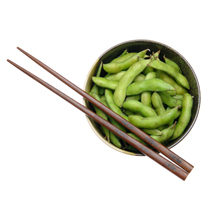 Serving: 4; Calories: 206; Total fat: 16 grams; Sat Fat: 2 grams; Carbohydrate: 15 grams; Protein: 4 grams; Dietary fiber: 4 grams; Sodium: 28 mg. Excellent source of Vitamin A and Vitamin C.
Dahlia is a graduate student pursuing a master's in nutrition and exercise physiology at Teachers College, Columbia University, and a dietetic intern at Baylor College.